A bunion is an enlarged growth of bone or tissue on the side of the big toe. 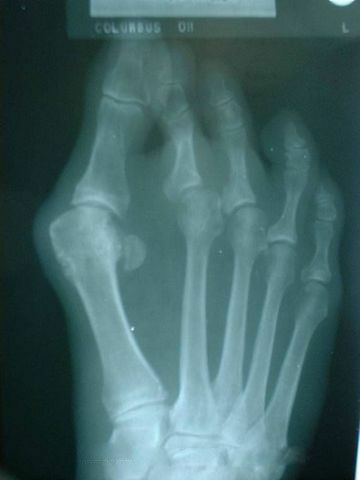 It appears as a displacement deformity of the big toe and may affect one or both feet. The formation of bunions is common, more so in women than men. It’s probably due to the added pressure placed on this area of the foot from narrow tight fitting high heels. Injury may also be a contributing factor as well as heredity. You may be at higher risk for developing bunions if you have certain types of arthritis, such as rheumatoid arthritis or gout, or have multiple sclerosis or cerebral palsy. Bunions develop because of abnormal structure of the foot and mechanics that place too much stress on the big toe area. This causes ligaments and other tissues to stretch thereby allowing the big toe to deviate and pull toward the second toe. When a bunion first begins to form, there may be little or no pain, but as the area begins to enlarge and become more pronounced, the large toe begins to point more toward the other toes. The deformity becomes more noticeable and swelling and inflammation worsen. Pain may spread to the other toes as the big toe continues to curve. The painful pressure may come from the inflamed joint itself or be triggered by external pressure from shoes. The formation of a bunion may cause excessive friction from the shoes which can lead to additional complications. Calluses, corns and ingrown toenails may also occur. Bunions worsen with time so early detection is important. Your doctor will need to determine and discuss with you the best course of treatment based on the severity of your case. If you have diabetes, your feet are at additional risk with the development of these conditions, and you should contact Dr. Brook or Dr. Northcutt immediately at (972) 566-7474 Dallas, or (972) 943-3323 Baylor/Plano. The doctors and staff at Dallas Podiatry Works can have your feet back to good health in no time!